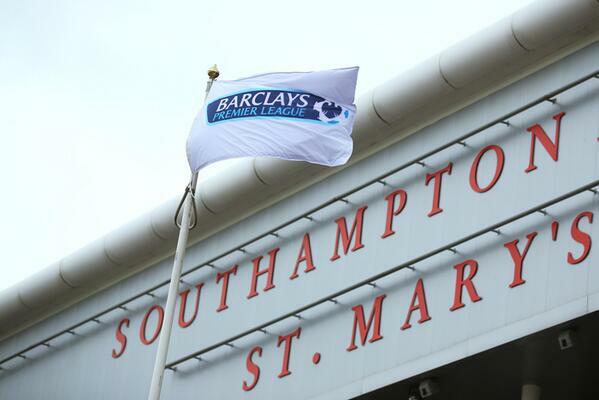 (GAMEWEEK 4) at St. Mary's Stadium, Southampton. SOUTHAMPTON - ﻿It finished all even at St. Mary's as Southampton and West Ham United finished goalless as the rain poured down in Southampton. Southampton got things underway, but soon after they found themselves defending a free-kick on the edge of the box. Although in good territory, it came to nothing and lines were cleared well. Luke Shaw showed early signs of great play departing gracefully from trouble in the left-back position. Goalkeepers got the better of each other taking turns in delightful saves. First up, a terrific peace of play by Mo Diame allowed him to get past Luke Shaw and belt it at the keeper, but wishes of an early lead were simmered as Boruc palmed away. Then on the other end, Jääskeläinen made a great save to deny Dani Osvaldo on his first goal. It was a well-hit shot but went too central allowing the keeper to save it with his chest mid-air. A decent first fifteen minutes to open the game. Two fantastic saves, promising stuff from the youngsters - especially Luke Shaw - and a game that looked like it was welcoming itself to some goals. Rickie Lambert's scoring form could have continued, with some sloppy defending as the centre-half defending went to ground allowing it to fall back out to Lambert, but not enough on the volley. 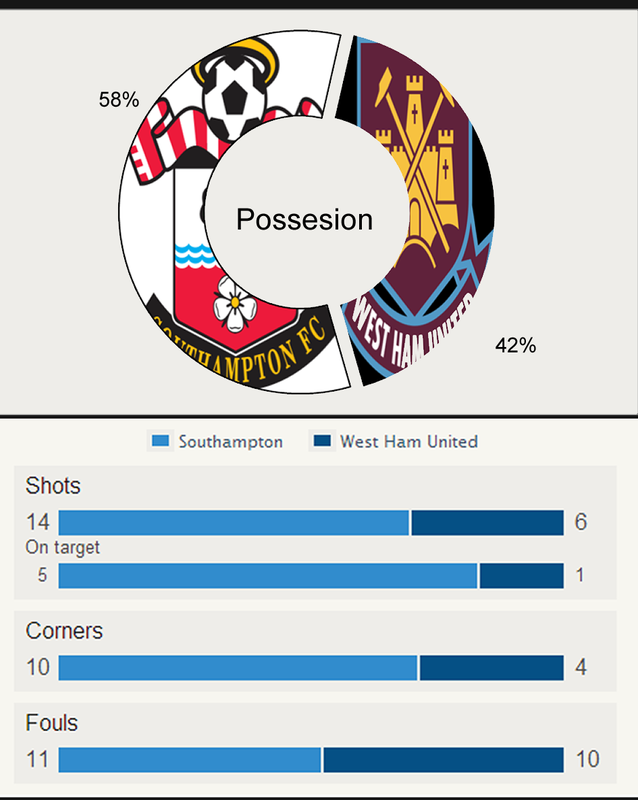 While West Ham did have their fair share of chances, they did not seem definitive enough to act on much. Around 10 minutes after being emphatically denied of a goal, Mo Diame received the first booking of the game for tripping up Adam Lallana. Cynical. The Hammers could have taken the lead when Boruc's save was forced out to Nolan who hit the back of the net from a first time shot, but it was a questionable call by the linesman on further inspection. Excellent finish regardless. Further injustice from officials may have taken place as Diame went down from a challenge by Schneiderlin, as it was late but no booking was received. Diame was still feeling the effects for a few minutes as he gingerly made his way around the pitch. Southampton's Rickie Lambert earned a free kick from the corner of the box after an overly-eager challenge by Demel sent him down. Lallana's delivery came of a head in the box, but who's head was it? Minor protests from the Saints came to nothing and it was a goal-kick for the visitors. West Ham's indecisiveness was once again the roadblock from some scrappy play that lacked quality. Morrison - who made his first start for the Hammers - had a more preferable shot from 30 yards out, curling away just past the post - optimistic. But the quality continued to vary, with Nolan making a mess of the pass heading into the stands. Exigent. Morrison exemplified his quality after with a great pass feeding into the box, but the chance was blown in the last action of the half. Some sloppy football, rare chances and indecisiveness from West Ham United, and Southampton for that matter. Robert Shaw and Ravel Morrison looking good on and off the ball. Talking points about the bookings that were not booked and questionnable offside call. Best moment of the half? Jääskeläinen s save to deny Osvaldo no doubt. In terms of Premier League quality, this half did not really match up. Sluggish - not only am I describing the first half here, but how they walked out onto the pitch in the second. The Saints were slow to come back out of the tunnel, frustration was growing from West Ham. As a result, Southampton started the second half with 10-men as Wanayama was late to get back on the pitch - good call by the referee, the conditions out there are not exactly ideal to stand around. As the rain heavily poured down in St. Mary's, play improved. Victor Wanayama dipped his shot sending it on target, but Jaaskaleinen tipped it over. West Ham had a chance but it followed the same formula as before, get into the box and squander the play. Brighter spells for Southampton too with Dani Osvaldo making a run to the box after the pass from Rickie Lambert. It came to Adam Lallana but Jaaskaleinen shut him off from the goal. Improvement. Morgan Schneiderlin executed an amazing overhead-kick, superb acrobatics on display, only to be blocked by James Collins. Minutes later, West Ham made the first substitution as Razvan Rat came on and Guy Demiel ended a lackluster game. With just half an hour remaining, the game was approaching the end, but things got more tense. The crowd got louder, defenders worked harder, attackers relentlessly tried... maybe a bit of an exaggeration, but things did heat up in search for the winning goal. Southampton had another great spell of play, falling to Schneiderlin who went for a volley, bouncing off the ground and Jaaskaleinen goes flying to save it once again. Some late substitutions as the game wrapped up, not much of a difference things just were more relaxed. Adam Lallana off for James Ward-Prose and Modibo Maiga off for Ricardo Vaz Te. Maiga had little presence up front for the Hammers. Again, the veteran Jaaskaleinen was brought into action, this time to deny Rickie Lambert. The Finn was having a superb performance in between the sticks. Ten minutes left and it was all goalless, but the atmosphere was just there, poised for that winning goal, would it happen? As we approached stoppage time, that was not the answer. 10 minutes of close chances, but not close enough. Followed by four minutes of stoppage time, with nothing looking to materialize. West Ham may have been on the other side of justice unfortunately in the first half. The offside call on Matt Jarvis was questionable, had it not been offside Nolan's spectacular finish would not have gone to waste. Mo Diame may feel some frustration too, considering the challenge by Scheiderline went unsanctioned - but it should have been a booking. It was a pretty dull first half of football, but Jääskeläinen's save was the best moment of it. Superb save. Indecisiveness - look no further than the Hammers. They just could not make their mind-up in the first half, and as a result the quality varied widely. Jaaskaleinen pulled out some cracking saves, he is the Man of the Match. Collins had the perfect chance for the winner, he had the shot to take the game in the 83rd minute, but simply failed. Jussi Jääskeläinen is the Man of the Match. The Veteran had an absolutely superb game, keeping it all even and making three of the best emphatic denials. Great day in between the sticks. Lackluster game, Jaaskaleinen's saves reserve all the highlights for this one. At least they did pick up towards the end of the game, goalless draws are not exactly fun to watch, and this was not the best of games. Both only take a point from their efforts. 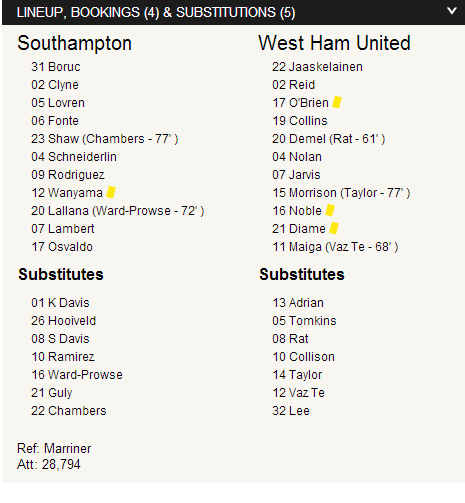 MATCH COVERAGE, RESULTS, FROM SOUTHAMPTON FC SAINTS VS. WEST HAM UNITED IN GAMEWEEK 4 OF THE 2013-14 PREMIER LEAGUE SEASON.